At Tao Asian Bistro, the kitchen updates a favorite comfort dessert with a global twist. Coconut milk and tropical mangoes are added to the rice pudding mixture and the dessert is served in coconut shells over mango sorbet, fitting with the restaurant’s pan-Asian theme. 1. In large saucepan, combine whole milk, rice, vanilla beans and sugar and bring to a boil. Simmer over moderate heat, stirring frequently, until rice is tender and suspended in a thick, creamy sauce, about 30 minutes. 2. Stir in coconut milk and simmer, stirring occasionally, until rice is very tender and the liquid is thickened, about 10 minutes. Let cool slightly. Once cool to the touch, remove vanilla beans and fold in diced mango. 3. 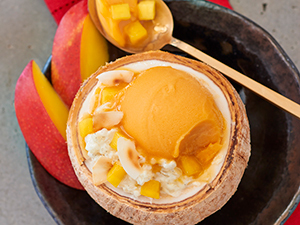 In coconut shell or small bowl, place a scoop of mango sorbet and about 2/3 cup pudding; sprinkle the top with toasted coconut.